I try. I really, really try to get into theater. But unless you’re naked, John Leguizamo or The Little Mermaid, I’m just not interested. For the first ten minutes I always think, “This is amazing.” About halfway through the first act, though, I find myself day-dreaming about “Scrubs” and Swedish fish, neither of which I actually like. Despite my penchant for shows about glee clubs, I stand with the large majority who feel it’s completely unnatural to break out in song at the deli or in math class. Some people are really into it. They see every Broadway show there is, and must be of very tiny stature and unlimited means in order to truly enjoy this. I’m not one of those people, in any way. Nevertheless, I was thrilled to receive tickets to Daniel Radcliffe‘s new play for my birthday, “How to Succeed in Business Without Really Trying.” Hirschfeld Theater isn’t very big, so from the second row of the balcony I had no trouble enjoying a decidedly clothed Radcliffe (side note: I was able to convince my husband that Radcliffe shows his toosh in this one). I wasn’t familiar with the play, but could appreciate the gross generalizations of a company too large for its own good, producing a product (wickets?) that no one really understands. I don’t want to spoil anything for you, but the play is about how to succeed in business without really trying. If you haven’t seen the commercials, turns out Radcliffe can do more than just strip down – he can really shake that money maker! And sing! He had one of the strongest voices in the cast, and though this time he was dwarfed by John Larroquette instead of man-beasts, it was only in physical size, not talent. He received a full standing ovation and the loudest cheers, though to my great disappointment, no one shouted, “You’re a wizard, Harry!” as I’d heard happened in a previous matinée performance. I’m very glad I saw the play, but my theater-mate, Babs, and I both agreed it was no “Equus.” We have bruises on our knees from the seats in front of us, and Babs got food poisoning, but I remembered to pack flip-flops this time, for the inevitable 14-block race back to Penn Station to catch the train home (we made it). I’m learning. Next postGOGP’s Guilty Flavor of the Week – Week 4!!! Well, I’m glad you kinda sorta liked it. Sorry about your bruised knees although you should probably come up with a better story than it was the seats in front of you. I have a few bruised knees stories myself. 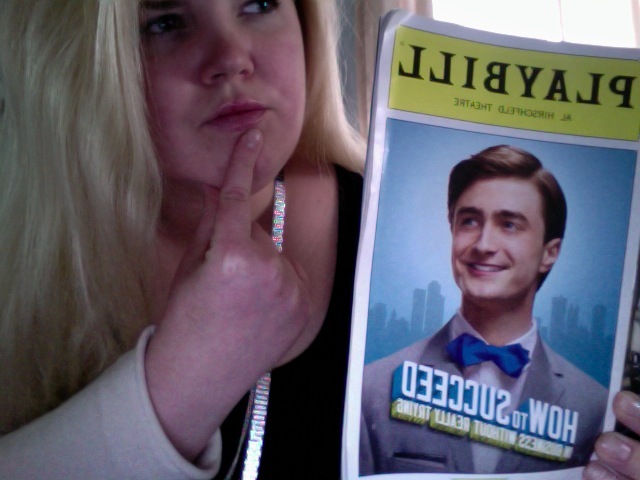 That Radcliffe can do it all: sing, dance, take his clothes off, and save the wizarding world from The Dark Lord. He could almost be James Franco.